McBride is following up on Vice Principals with The Righteous Gemstones, which he created and which he'll serve as writer and director. According to Deadline, McBride will "play the offspring heir apparent to Goodman’s world famous and acerbic preaching patriarch. As the McBride portrayed Jesse Gemstone arrogantly attempts to expand and modernize the global TV ministry that his Goodman played father Eli created 'a long tradition of deviance, greed, and charitable work, all in the name of the Lord Jesus Christ' comes into focus as the Gemstone legacy." 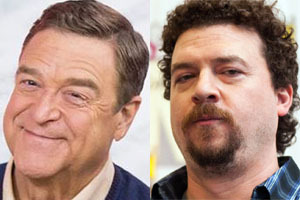 Deadline reports that the plan is for Goodman to shoot the HBO pilot first, then work on The Conners that ABC recently picked up following Roseanne's cancelation. If HBO picks up the pilot, then he'll work on The Righteous Gemstones after The Conners is done filming its first season. This project marks a return for Goodman to HBO, where he starred on Treme in 2010 and 2011.